Vietnam Wednesday jailed two American citizens and 10 others from an outlawed US-based "terrorist" group for attempting to overthrow the state after they spread anti-government leaflets and tried to incite protests last year. Critics of the communist regime are routinely jailed in the one-party state. Most are loosely-linked bloggers, activists and rights lawyers, with few groups designated as "terrorist organisations". One of those groups is the California-based Provisional National Government of Vietnam (PNGV), an anti-communist organisation with its own self-appointed prime minister that pledges allegiance to the former South Vietnam regime. Twelve of their members were jailed for between five and 14 years after a two-day trial in Ho Chi Minh City for "attempting to overthrow the state", according to Phap Luat newspaper, the mouthpiece of the city's justice department. They were accused of printing 4,000 leaflets, plotting to take over national radio and calling for demonstrations on April 30 last year -- celebrated as "reunification day" to mark the end of the Vietnam War in 1975. The group included two American citizens, Phan Angel and Nguyen James Han, who allegedly travelled to Vietnam from the United States to help the failed plot, state media reported. They were the only two to receive the harshest sentences of 14 years in prison and will be deported after serving their sentences. 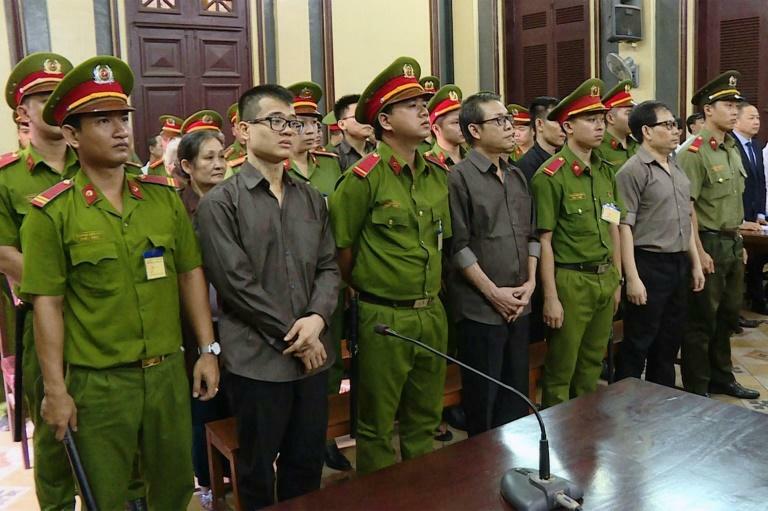 "The defendants' behaviour was extremely serious, violating national security, undermining the country's stability and development (and) causing political and social disorder," the official Vietnam News Agency quoted the court decision as saying. US embassy spokesman Pope Thrower said the safety of American citizens was a top priority. "We will continue to monitor Mr Nguyen's welfare, advocate for him and provide consular services until his release," Thrower said in a statement. The embassy was not authorised to speak about Phan. The foiled plan was allegedly set to coincide with a failed attack on Ho Chi Minh City's Tan Son Nhat international airport last year, for which 15 PNGV members were convicted. The group was also accused of bombing a police station in the city in June and injuring three people. The PNGV was established in 1990 in California, where large numbers of Vietnamese refugees settled after the end of the war. Its members, many who wear the yellow-and-red-striped southern flag of the former Saigon regime, say their aim is to "liberate Vietnam from communism". Hanoi and Washington now enjoy close ties, although a number of incidents involving US citizens in Vietnam this year have created a diplomatic headache between the former foes. Michael Nguyen, a California-based father of four is in custody for "attempting to overthrow the state", while American student Will Nguyen was convicted and deported last month for disturbing public order after joining protests in Ho Chi Minh City.